to honour the dedicated service to the community by both volunteer and career fire service members. The Museum currently has public display sites at the Tasmanian Transport Museum, Anfield St., Glenorchy (open every 1st and 3rd Sunday afternoon) and in the Hobart Fire Brigade 1911 old Head station, Argyle St. Hobart (Monday to Thursday by prior arrangement only). Other public display sites are planned for Burnie and Launceston. The Museum also showcases its appliances at community events such as Christmas parades and local fairs and fetes. As a volunteer brigade of the Tasmania Fire Service, the Museum draws its membership only from serving and retired, career and volunteer Tasmanian fire service members. This means the curators you will meet at any of our display sites, will have had "hands on" experience of the appliances and other artefacts you will see. 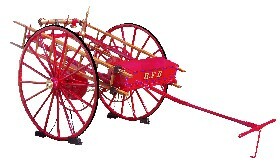 # 1826 hand drawn manual fire pump, Van Diemens Land's (Tasmania's) first fire fighting appliance for Hobart Town. # 1898 hand drawn hose reel cart; New Town Out-station. 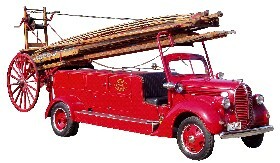 # 1913 Leyland turntable ladder, Hobart's & Tasmania's first motorised fire appliance. 1926 Garford 15 urban pumper/hose carriage; Hobart & New Norfolk Brigades. 1929 Dennis G urban pumper/hose carriage; Launceston Brigade. 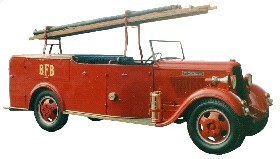 1929 Chevrolet urban hose carriage; Queenstown, Franklin & Lauderdale Brigades. 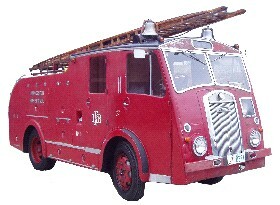 # 1935 Dodge urban pumper/hose carriage, Burnie's second motorised fire appliance. 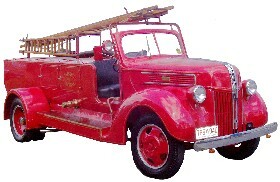 1937 Dodge urban pumper/hose carriage, Longford's first motorised fire appliance. # 1939 Ford V8 flat head hose carriage with a 50 foot (15 m) Morris Ajax wheeled escape ladder; part of Hobart Brigade’s fleet upgrade in anticipation of WW 2 hostilities. # 1941 Ford V8 flat head urban pumper hose carriage; part of Hobart Brigade’s fleet upgrade in anticipation of WW 2 hostilities; Hobart & Kingston Brigades. 1943 Chevrolet hose carriage, acquired under the WW II lend lease program for the EZ Co. zinc smelter, Risdon. 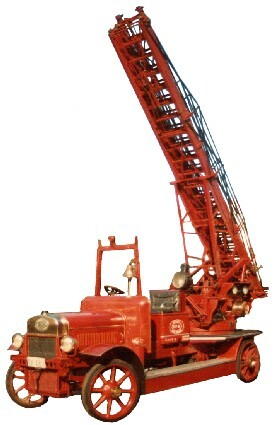 1952 John Morris 60 foot (18 m) escape ladder, Tasmania's largest ever item of manually operated fire fighting equipment; Launceston Brigade. 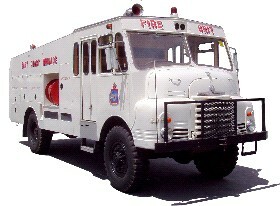 1955 Ford V8 OHV urban hose carriage:; Burnie & Currie Brigades. 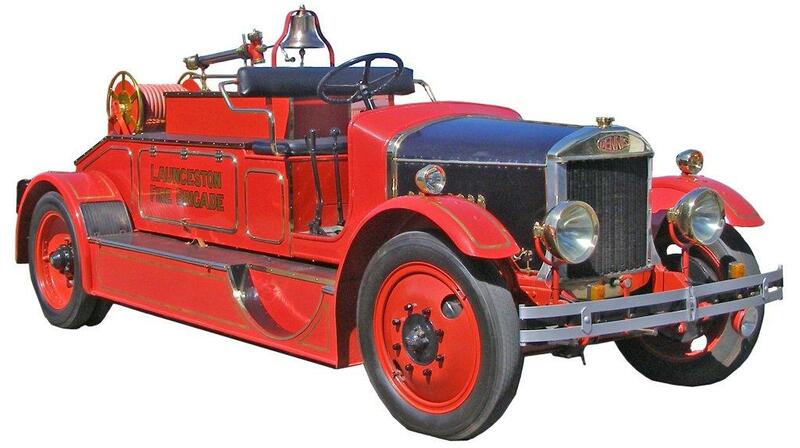 # 1955 Dennis F8 pumper/hose carriage; Launceston & Carrick Brigades. 1964 International AB160 urban hose carriage/pumper, ex MFB Melbourne; Triabunna Brigade 1977. 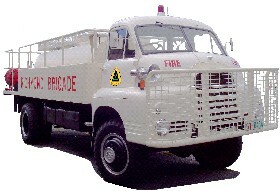 # 1965 Bedford RLHZ 4x4 rural heavy pumper, ex British AFS civil defence: imported by Rural Fires Board 1971. 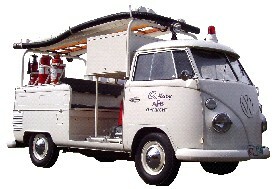 # 1966 Volkswagen industrial fire appliance, purpose built for the Cadbury chocolate factory, Claremont. 1969 Dennis "D" series urban pumper/escape, Devonport & Latrobe Brigades. # 1970 Bedford RLHC 4x4 rural heavy tanker; Richmond Brigade. 1971 International C1600 urban pumper/hose carriage: Launceston Brigade. 1975 International D1410 4x4 rural medium tanker: Margate Brigade. 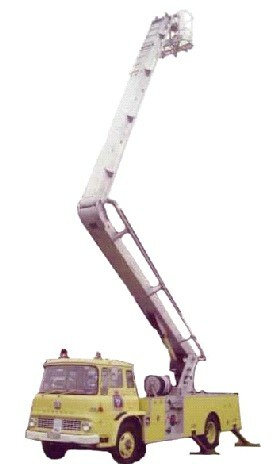 1978 International ACCO 1810A urban medium pumper: Hobart & Margate Brigades. 1980 Toyota Land Cruiser 4x4 light tanker; Hobart, Fern Tree & Koonya Brigades. 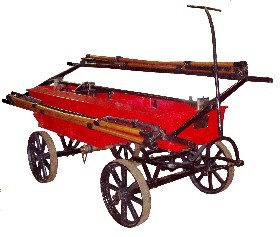 The Museum also has in its care a wide variety of photographs, books and items of fire service equipment. The Museum markets a range of fire service books, souvenirs and memorabilia to raise funds to assist in the maintenance and restoration of fire appliances belonging to the Museum.